I completed my Bachelor of Science (Zoology) at Western Sydney University in 2016. During my studies I had the privilege of undertaking an internship through Hawkesbury Institute for the Environment, whereby I worked closely with Dr Anastasia Dalziell and Dr Justin Welbergen, studying the vocal mimicry of the Superb Lyrebird in the Blue Mountains. I have always been passionate about animal conservation and this experience has helped me realise my dream to work in research. After taking a short break from study, I began my Master of Research with the Animal Ecology Lab at Western Sydney University in 2019. 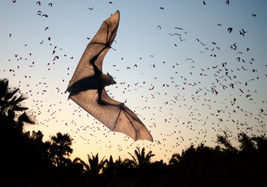 I am interested in the field of movement ecology and, in particular, the drivers of flying-fox urbanisation. I plan to research the diet of Grey-headed Flying-Foxes by pollen analysis of samples (from fur and scats) across a range of natural and urban habitats along the East coast of Australia. I hope that this information will aid the development of effective conservation strategies for this ecologically important, threatened species.